RICHLAND, Wash. – Were it possible for a pink wine to enjoy a cult following, Barnard Griffin‘s Rosé of Sangiovese likely would qualify. For the better part of 15 years, winemaker Rob Griffin has been crafting a dry rosé from the noble red grape of Tuscany with spectacular results. Last month at the 30th annual San Francisco Chronicle Wine Competition, Griffin’s 2014 Rosé of Sangiovese earned a gold medal. It was the ninth time in 10 years that the rosé has earned a gold medal or better at the largest judging of American wines. Its only silver in the past decade was in 2013 – and that year, the wine earned best rosé at the Great Northwest Wine Competition. The 2014 edition was released last weekend by the longtime Washington winery, just in time for Valentine’s Day. This week, we sat down with Griffin to talk about the origin of his rosé and the following it has gained. Rob Griffin and his wife, Deb Barnard, launched their eponymous winery in 1983. 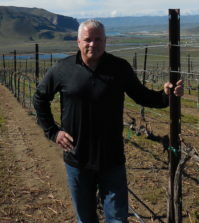 Griffin had arrived from his native California in 1977 to work for Preston Wine Cellars in Pasco, Wash. After starting his own side project, he later became head winemaker for Hogue Cellars for several years until he focused all of his efforts on Barnard Griffin in the early 1990s. 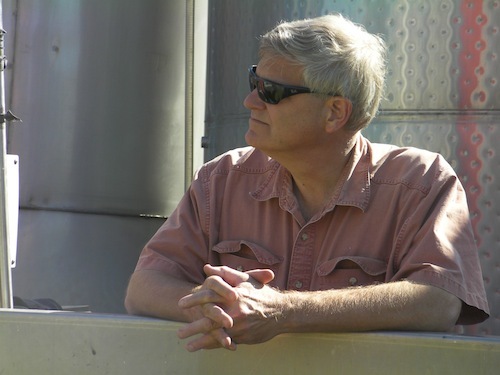 In those early days, Pasco grape grower Maury Balcom helped Griffin get his start with such grapes as Chardonnay, Riesling and Sauvignon Blanc. “We’ve had a good, tight relationship ever since,” Griffin said. In the 1990s, Balcom had a few acres of Sangiovese that didn’t have a home. Griffin was not necessarily interested in adding the variety to his portfolio, but he did offer to make the wine for Balcom to sell. Griffin’s first effort at turning it into a red wine was less than satisfactory, so he got to thinking about making a rosé the next year. Griffin wasn’t sure whether wine drinkers were ready for a serious pink wine. That first year, in 2002, Griffin turned out a few hundred cases of wine, and it sold quickly. 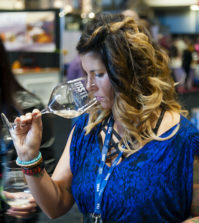 About that time, Griffin began entering it in the San Francisco Chronicle Wine Competition – and winning gold medals at the country’s largest judging of American wine. Today, Griffin makes a lot of rosé. 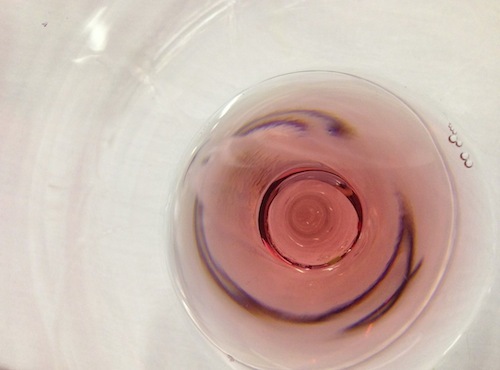 At 11,400 cases, the 2014 Rosé of Sangiovese makes up more than 15 percent of his total production. At a retail price of $13, the spectacular rosé is typical of a Barnard Griffin offering because it is a great wine at a value price. And even with the larger production levels, the Barnard Griffin staff fully expects it to vanish by midsummer. 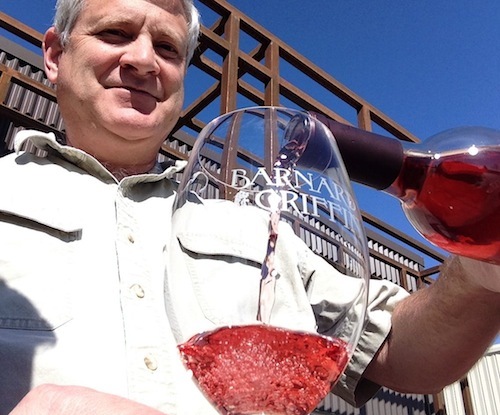 By the time February rolls around, Barnard Griffin fans have a pent-up demand for the new wine, and its bright flavors remind wine lovers of sunny days that are just around the corner. “It’s a harbinger of spring, if you will,” Griffin said. Like any top-shelf wine, a delicious rosé is not made by accident. Griffin’s efforts with his Rosé of Sangiovese start with vineyard practices that would seem the opposite of what is expected. Griffin is looking for grapes that are lower in sugar (resulting in lower alcohol) and higher in acidity. While high-end Cabernet Sauvignon and Merlot might be anywhere from 2 to 4 tons of grapes per acre of vines, Griffin has found that great rosé comes from something closer to 7 tons per acre. This means more money for the grape grower and more wine for the consumer. 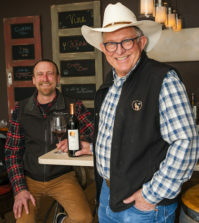 In addition to continuing to purchase grapes from Balcom, Griffin has added Gunkel Vineyard near Maryhill and Lonesome Spring Ranch in the Yakima Valley to his portfolio of growers who provide him with Sangiovese. 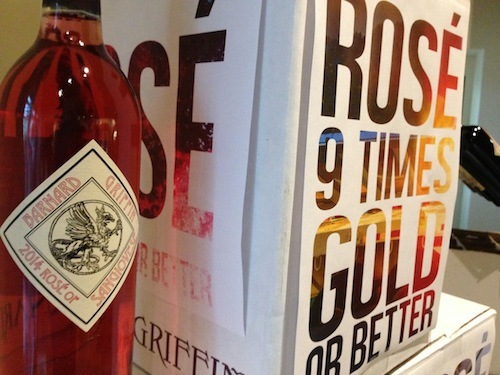 Griffin’s rosé is relatively low in alcohol (12.9 percent). With an imperceptible level of residual sugar, it is dry and is backed by lip-smacking acidity. The closest it comes to seeing oak would be any barrels that are placed next to the stainless-steel tank it is made in. Griffin describes the wine in terms of fresh summer flavors, including watermelon, pomegranate, cranberry and even a fascinating hint of citrus. 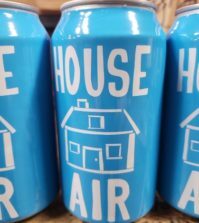 It’s also delicious with barbecued chicken, grilled burgers, salmon, ahi tuna and, as Thanksgiving approaches, roasted turkey. “It’s really a surprisingly versatile wine,” he said. 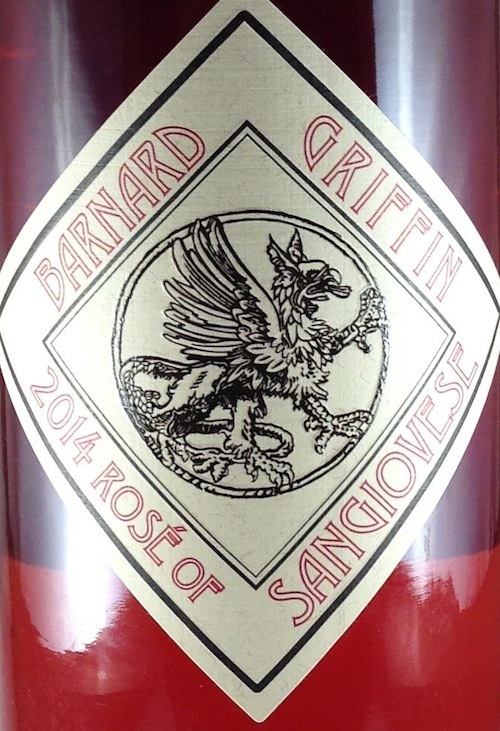 The Barnard Griffin 2014 Rosé of Sangiovese should be fairly easy to find for the next few months throughout the Northwest, particularly in grocers and wine retailers in the Seattle and Portland markets.